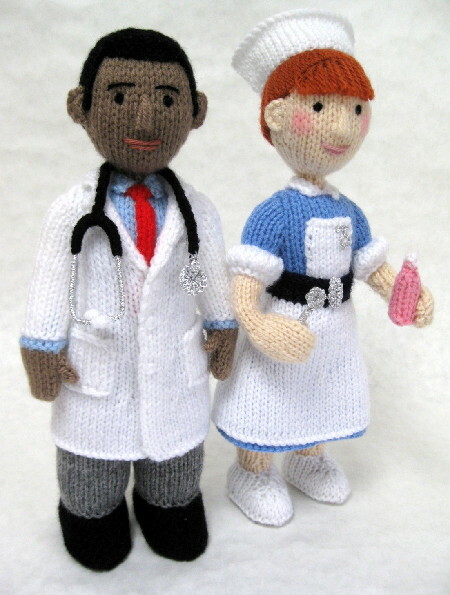 Measurements The doctor is 10½in (26.5cm) tall, and the nurse is 11in (28cm) tall, including cap. You will need Doctor: Of Hayfield Bonus DK 100g balls: 12g each in Charcoal 837 and Walnut 927, and 6g in Powder Blue 960; of Hayfield Bonus Toytime DK 25g balls: 24g in White 961, 10g in Black 965, and 1g in Signal Red 977; oddment of deep coral DK yarn; oddment of silver lurex yarn; pair of 3mm (no.11) knitting needles; stitch holder; 30g of washable toy stuffing; scrap of stiff card; plastic drinking straw; 5in (12.5cm) pipe cleaner; long tweezers; clear adhesive. Nurse: Of Hayfield Bonus DK 100g balls: 16g in Flesh Tone 963 and 10g inCopper 843; of Hayfield Bonus Toytime DK 25g balls: 24g in White 961, 14g in Bluebell 969; and 1g each in Navy 971 and Pink 992; oddments of dusky pink and black DK yarns; oddment of silver lurex yarn; pair of 3mm (no.11) knitting needles; stitch holder; 30g of washable toy stuffing; scrap of stiff card; plastic drinking straw; cotton bud; pink pencil; long tweezers; clear adhesive; hair spray.